Looking for a USED STH-400/4000? Pinacho offers to his customers the CNC blat bed lathe STH-400. 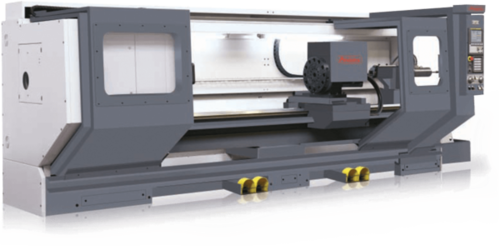 Robust machines up to 805 mm in swing over bed, 5000 mm in bed length and 230 mm in spindle bore. 2, 3 or 4 axis parallel lathes combined with Fanuc, Fagor or Siemens control. We are a spanish manufacturer of conventional and cnc lathes with more than 55 years experience in manufacturing a wide range of lathes. We are constantly developing our technology which has earned us a reputation for quality and competitiveness. Looking to Purchase a New PINACHO STH-400/4000? Bernardo Reyes No. 1627 Nte. CNC Suministros e Ingeniería del Norte, S.A. de C.V.
11488 - 70th Street S.E. Transv. 93 No. 61-32 Int. BKB Maquinaria Industrial CIA. LTDA. Dimasolda, S.A. | Blecken Ibérica, S.A.
Champion Machine Tools (HK) Co.,Ltd.